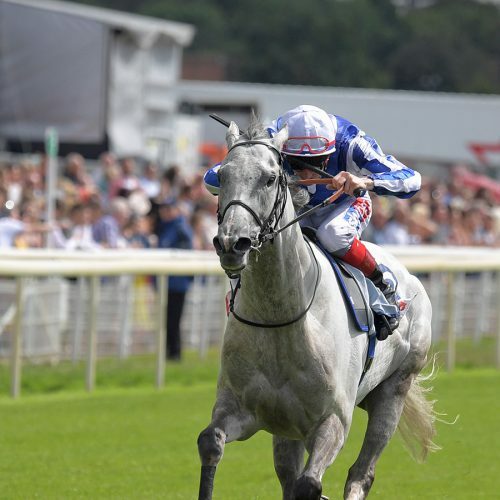 Thundering Blue was the odd one out in this year’s Juddmonte International Stakes. Unlike the other seven runners, he did not have at least one Group 1 win to his name. In addition, he was the only supplemented runner – connections paying £75,000 to add him to the field. It looked quite a gamble and few believed it would pay off, but the decision to roll the dice was more than vindicated – Thundering Blue staying on strongly from off the pace under Fran Berry to claim third behind Roaring Lion and Poet’s Word. In total, he was beaten three and three quarter lengths. Third prize was £114,000. David Menuisier, the trainer, was rightly proud of his gallant grey, who has progressed through the handicap ranks. “I’m so proud of him. The way he came home, against that calibre of opposition, I’d like to think he can win a Group One.